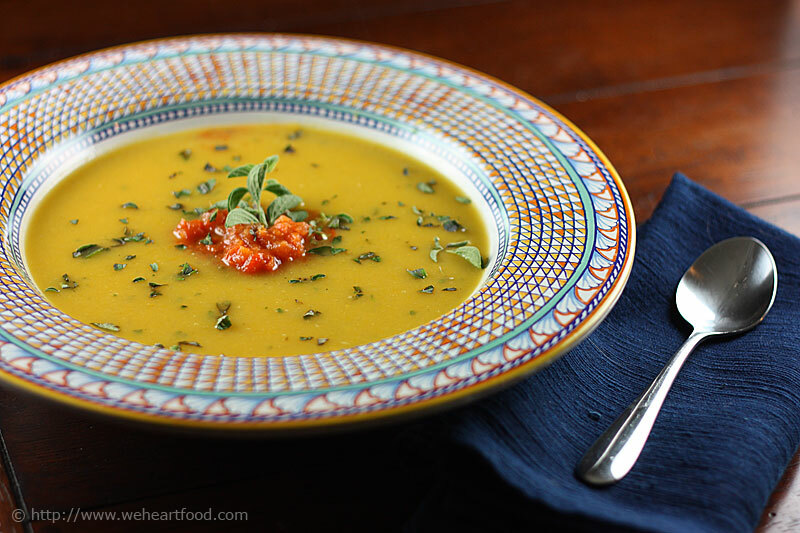 We returned from our weekend outing not having gone through all of our CSA veggies, so this recipe from the Ultimate Soup Bible turned out to be a great way to use up our tomatoes, our heads of garlic, and the rest of our squash. The spiciness of the salsa gives contrast to the sweetness of the roasted squash and garlic. We served it with a Roasted Garlic & Pecorino Loaf from Metropolitan Market, so I’m sure we’ll be vampire-free for a while. Does anything smell better than roasted garlic? I doubt it — and you can really smell it in this soup! I like this soup more with every spoonful… I wish I had used juuust a little less veggie broth, it’s a little on the thin side for me. Yeah, it’s a bit thin, but tastes really good. And the salsa seemed really hot at first, but it’s less spicy once you stir it all together. That sweet-and-spicy combination is a winner. I’m not a huge fan of the fresh oregano, though. Really? I like it, it’s a bit mellower than dried. Well, it’s not like it’s ruining my soup — I’m taking this to work for lunch for sure. Just don’t take our fancy new bowls with you! Preheat the oven to 425 F. Cut the 1/4″-1/2″ off the top of the heads of garlic to expose all the cloves. In a small baking dish, add 3/4 cup of water and a tablespoon of white wine vinegar, then the garlic bulbs. Brush the cut cloves with a little olive oil, then cover the baking dish tightly with foil. On a large baking sheet, place the squash and brush with a little olive oil. Next to the squash, add the tomatoes, bell pepper, and jalapeño. Roast the vegetables for 25 minutes, then remove the tomatoes, bell pepper, and jalapeño. Reduce the heat to 375 F and cook the squash and garlic for an additional 25 minutes, or until the squash is tender. Meanwhile, use a knife to scrape the outer skin off the bell pepper. In a small blender or food processor add the tomatoes, bell pepper, jalapeño, and 1 1/2 tsp olive oil. Pulse until blended but still somewhat chunky. Stir in the vinegar and season to taste. Heat a tablespoon of oil in a large dutch oven and cook the onions and coriander for 10 minutes over medium-low heat, until the onion is softened but not browned. Squeeze the roasted garlic out of its skin into the onions and scoop the squash out of its skin, adding it to the pot. Add the stock, 1 tsp of salt and plenty of black pepper. Bring to a boil, then simmer for 10 minutes. Stir in half the oregano and cool slightly, then use an immersion blender to puree to a smooth consistency. Ladle into bowls, top each with a large spoonful of the salsa, and sprinkle over the remaining oregano. This entry was posted on Sunday, January 4th, 2009 at 10:51 pm	and is filed under Main Dishes, The Soup Bible. You can follow any responses to this entry through the RSS 2.0 feed. You can leave a response, or trackback from your own site. This looks like a lovely winter soup. And nice fancy bowls too! This soup sounds incredible, and so comforting. I love squash soup, but I usually just make an apple variation, I’ll have to try this one out. My friend and I made this soup with a few changes (accidental and not). We didn’t have fresh oregano, so I’m not sure if the dried stuff had any effect in the taste. We didn’t have vegetable stock, so we substituted chicken stock. It still tasted good, but I’m curious what it tastes like w/ the other stock. Finally, we mixed the salsa with the soup. By accident. The soup still tasted delicious. So thank you so much for putting this soup recipe out there! How do you guys like your CSA membership? We live in the Puget Sound and are looking into joining one. Any recommendations? Rosemary — replied to you via email. Congratulations on winning in DMBLGIT February 2009. The photo is simply beautiful!